Postcard from the collection of Sharon McQueen. There were early libraries and literary societies in Dublin, however they were not free; one had to pay dues to be able to read the books and belong as members and subscribers. 1793 October 29: Dublin Social Library was established. Isaac Appleton was chosen clerk and a committee was formed to purchase books. The price was $2 for a share in the library. Librarians were paid $4 per year for their services. 1797: The Dublin Social Library was incorporated. 1798: The library had 93 books. They paid $11.25 to have them covered in sheepskin. In 1920 some of these books were still available to read. 1799: There was a Dublin Ladies' library. By 1851 there were 161 volumes in the Ladies' Library. Mrs.Lucy Marshall was the librarian. 1822: The Dublin Juvenile Library was instituted. This was free to all persons in town. 1824: A society was formed called The Dublin Literary Society. Meetings were held in the winter months. The fee for admission was $2 and there was an annual assessment of 25 cents. 1822: The Dublin Juvenile Library was formed as a joint effort of the Rev. Dr.Levi Leonard and David Carter MD. This was the first free public library, supported by voluntary contributions. Initially the books were in a room at Chamberlain's Tavern (the former parsonage of the Dublin Community Church) and Dr.Leonard acted as the librarian. The Books were eventually moved to Dr.Leonard's house on Old Common Road. By 1852 there were 990 volumes though some were lost or worn out. This library is considered the precursor of today's Dublin Public Library. Note: Peterborough Town Library was founded in 1833 and is the first free tax supported public library. 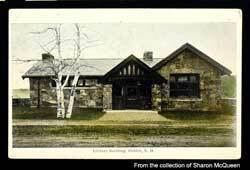 1884: The Town of Dublin at its annual meeting voted to establish a town public library by a vote of 54-21. One hundred dollars was appropriated and a room at the Town Hall was to be known as the Library Room. There "needed to establish a committee of three to oversee the above and report back their doings at the next annual meeting." The first three on the committee were Walter J. Greenwood, Henry H. Piper, and George W. Gleason. By 1889 the library had 947 volumes and in 1890 the books from The Dublin Juvenile and Dublin Union Library were moved to the Library Room at the Town Hall. 1900: Mrs.Eliza Carey Farnham undertook to build a town library as a memorial to her late husband, Horace Putnam Farnham, MD. Mrs.Farnham chose Mr.John Lawrence Mauran of St.Louis, Missouri, as the architect. Mr.Mauran was a summer Dublin resident as was Mrs.Farnham. Mr.Mauran had already designed several summer homes in Dublin, was later the architect for the Consolidated School and the new facade for the Town Hall. The builder was Alamander L. Ball whose experience includes Emmanuel Church and other homes in Dublin. Mrs.Farnham also gave an endowment fund for the maintenance and management of the library. On July 10, 1900, the cornerstone was set and construction of the Library began. The dedication of the building as the Dublin Public Library was held on June 20, 1901. 1999: The town voted to build the library addition at a cost of $684,885; at least $214,885 was to be raised privately. The addition to the present library was completed by 2000.
at 7:00pm on the main level of the library. ​Dublin residents are welcome to attend.